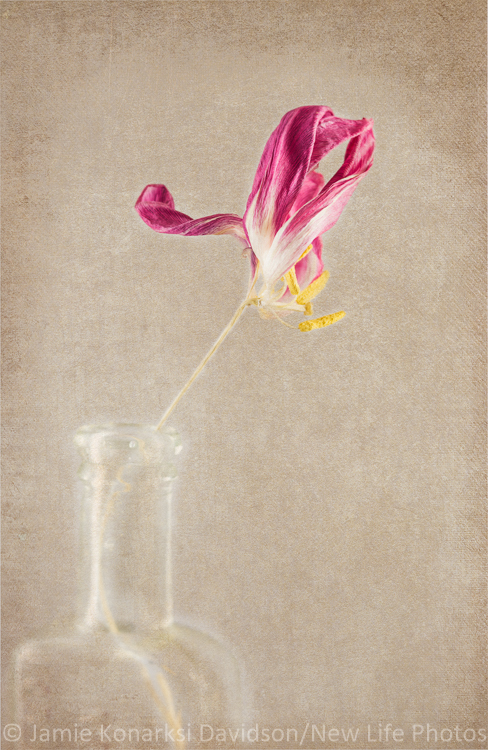 This was where the light tent adventure began … The dried tulips in a bottle and Topaz Texture Effects. Playtime. One of the first images inside the light tent. I needed to remind myself that this was a learning adventure, not an exercise in “perfection,” which, by the way, is impossible. With anything new that we want to learn how to do, there is a learning curve. How steep that curve is depends on where you are when you begin. If you are a beginner in photography, learning a new camera, or you find yourself still struggling with the foundational concepts and application of exposure, then adding a new technique will likely be more difficult. This doesn’t mean you shouldn’t try when given the opportunity – just cut yourself some major slack if it is harder for you to understand and execute. Recognize any limitations – accept them, and push on. Well, I stepped out recently in several ways. I’ve started working more textures and image blending into my photography. 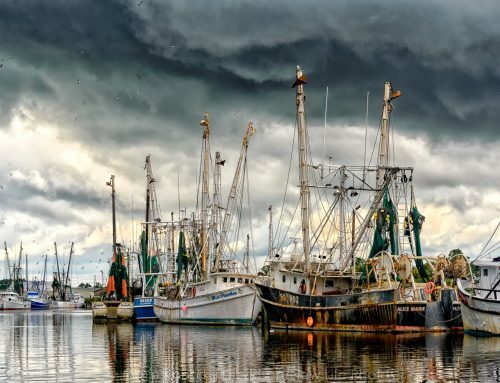 I’ve always admired the work of those who incorporate them into their work and create images that are drenched in creativity and emotional impact. Thankfully, this learning experience is further along than my latest adventure with a light tent. For me, this image “feels” better, and the simplicity is more pronounced than with a stark whitish background. Most of my work with flowers and other small subjects happens outside – in the field or during sessions (aka dates) in my back patio. I grow and buy plants and flowers that I find interesting and beautiful and explore them photographically. Since they are “my” subjects, I can move them, cut them, tear them apart, spray them with water and take my time with them. What I know and accept about myself is that very often I need to squeeze a “learning date” in compressed windows of time. As much as I’d love to come to the table fully prepared with research and directions on how to do something, it doesn’t always work out that way. So, I gather my materials, rely on my current knowledge base and start doing (aka playing). This means that I bring to the table everything I know and then step out … experiment with a degree of logical choices to begin the process. I know before I start that there are things I already know and things I don’t. I will learn by making mistakes and re-framing. There is value in making mistakes. They lead us toward “right” answers. In comes the small light tent (cube). I acquired it and a set of lights for free. It does not have the easy option of adding backgrounds, and it has a slight lean. And, we’re still in the winter cold season, so an indoor shoot is what I had to work with. I have used diffusers and reflectors for years. They work and are wonderful for controlling light and shaping subjects. I have never worked with a light tent or small lights. Here was my opportunity. 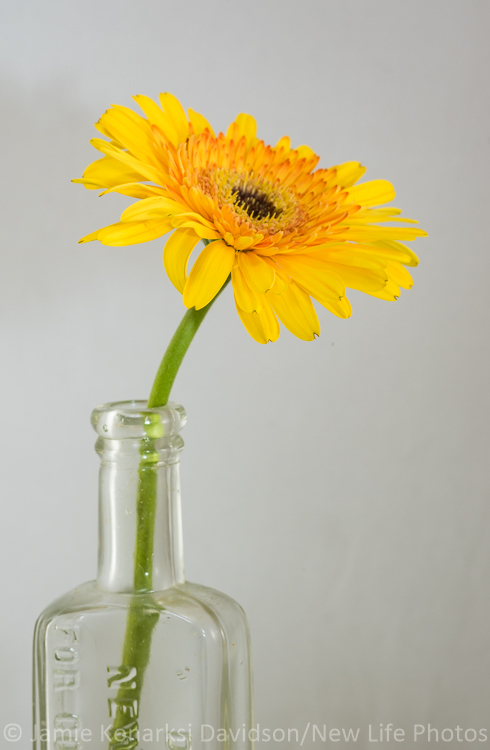 I had some dried tulip blooms and small old bottles for the first shoot, and I had some lovely yellow flowers and another old bottle for the second shoot. 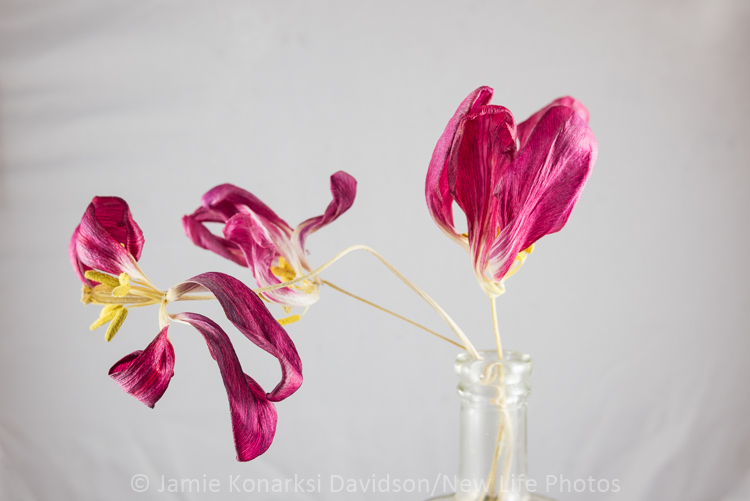 A different angle on the remaining tulip bloom in the light tent. I should add that I don’t have a wonderful window in my house that would or could provide added natural light. So, I set up everything on the dining room table. A fun challenge as I had to figure out the best way to arrange the tent and lights (small with at most 8” stands). What I needed, in addition to the two lights was a good way to light the back panel evenly. I am still working on that. I started out with several blooms in the bottle and found a design and flow I liked. I started working with it. Then, I had the idea of rearranging some of the dried blooms. Big mistake . 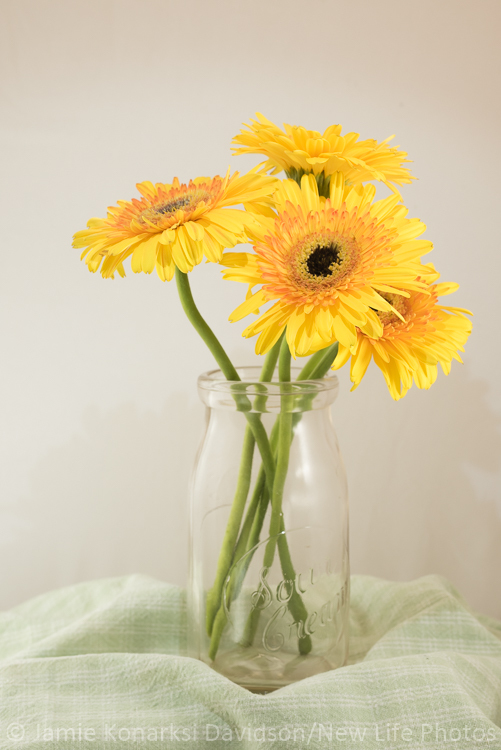 . . almost all the dry petals fell off all the stems except one. Re-frame. 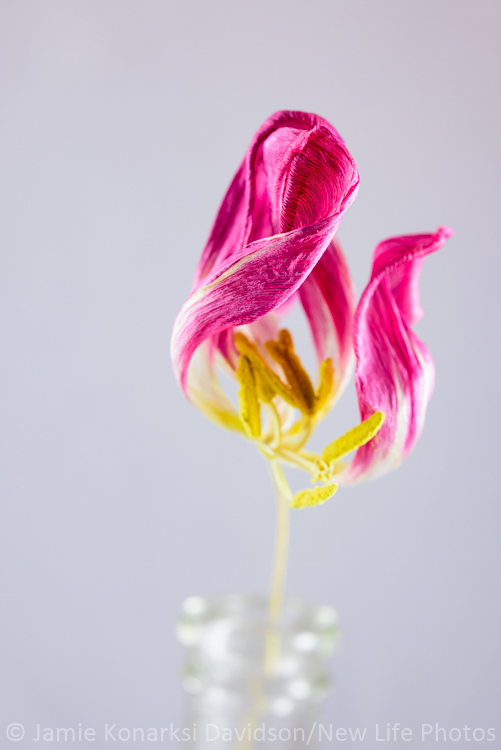 I worked that one dried tulip instead of beating myself up for the fallen petals. Are there lessons? Just a few. 1) Be careful when you’re working and moving dried flowers. They’re more fragile than you would like them to be. 2) The corner seams of the light tent can be problematic. Raise the set-up to take that out of the equation to minimize the post-processing “fix it later.” 3) Lighting in a light tent can be challenging. If the lights on outside are not enough, you need to find more ways to light your subject. Direct, frontal flash creates shadows on the background. Some could be interesting, but mostly they are a distraction and something you’ll want to remove later. With the fresh flowers, a complementary fabric on box (raising all above the light tent seams), the second learning session is off to a better start. I knew this would happen, but wanted to share what happens when you flash directly at your subject while inside the light tent. Shadows sometimes can work with a subject, but not this one. This time I brought more knowledge and experience from my first attempt at the tent. 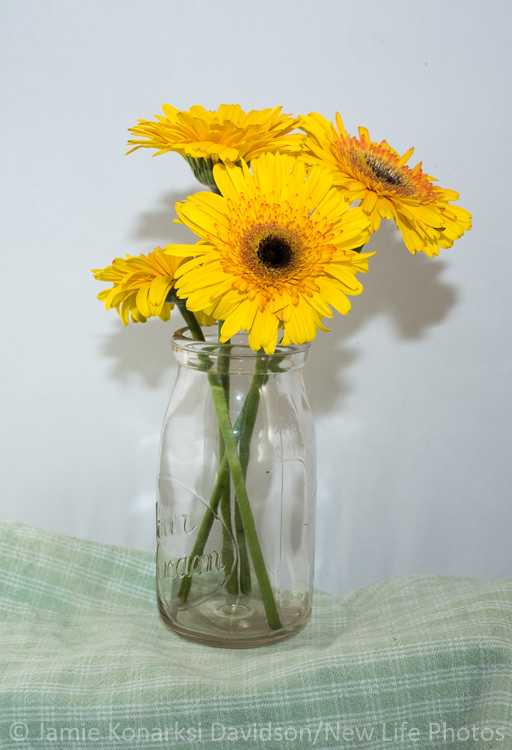 I decided to use a larger light tent to give me room to raise the flowers in the jar. In setting up the flowers to shoot this time, I brought in a small box about two inches high and large enough to hold the jar. I added a colored cloth to complement the flowers, hide the box and any corner or bottom seams of the light tent. I had a more stable set-up with the lights on the dining room table and didn’t have to fight the sliding stands. This time I arranged the lights and tested their impact by turning on and off and watching what happened to the lighting of the yellow flowers. I brought in my flash again and worked angles and intensity. I experimented with flash compensation (both plus & minus), bouncing that light off a small, silver reflector, fired direct flash (on purpose) to create shadows, and figured out that directing the flash through the diffusion tent from the top and high sides with both lights on worked fairly well. Flashlights can work to a degree, but not as well as you might think. Firing the flash from outside the diffusion tent works much better when the small lights are also on. Depending on the subject, you might try bouncing the flash or flashlight illumination off a small reflector. Are there more lessons to learn? More mistakes to make? Did I get everything right? Were my efforts “perfect”? Nope. Other options to try? Of course! But, what I know is that each time I work with the tent, I’ll come at it with more experience, more knowledge and more ideas on what I might want to try. 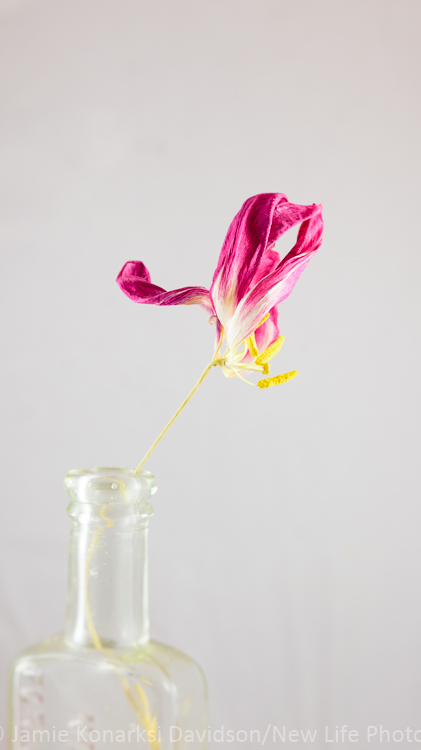 Going with the single bloom and same bottle, but firing the flash from above and outside of the light tent. Now that I’ve had some hands-on experience with the light tent, I’ll do some of the research needed to yield more successes than “failures.” I’ll find more ways to master the light in the tent and to add backgrounds with some sweep that complement the subjects. In warmer weather, and on a sunnier day, I’ll bring the tent outside and see the impact of natural light using the tent. I’ll scare up the flash stands that I know are somewhere (unused) in all my gear and work on remote settings. I have more to discover, more to learn, and more to imagine. I’ve given myself a challenge, and I’m up for it. What do YOU want to learn? Go for it! Bring what you have to the table and practice DOING. Don’t be afraid to make mistakes – you will. Learn from them as much as you do from your successes. In this never-ending road with photography, there is never nothing to learn. Embrace that awesome thought and yourself as a life-long student on a visionary journey. Do your best and know that in doing so there is always room for incremental improvement. 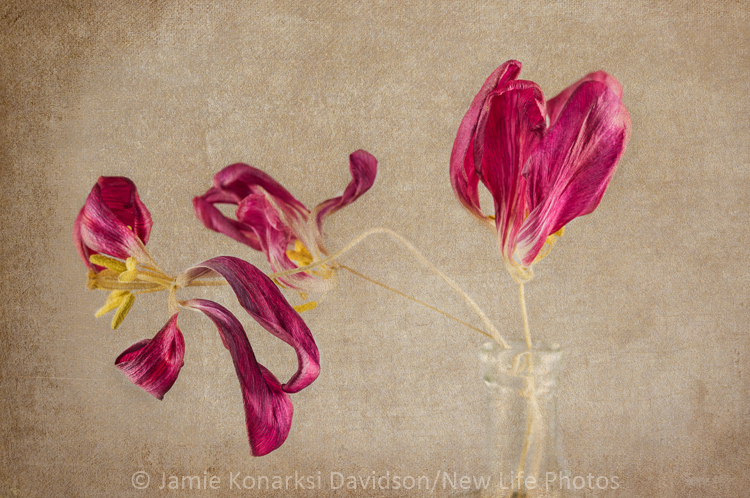 This is a blend of images and textures and Topaz Impression. 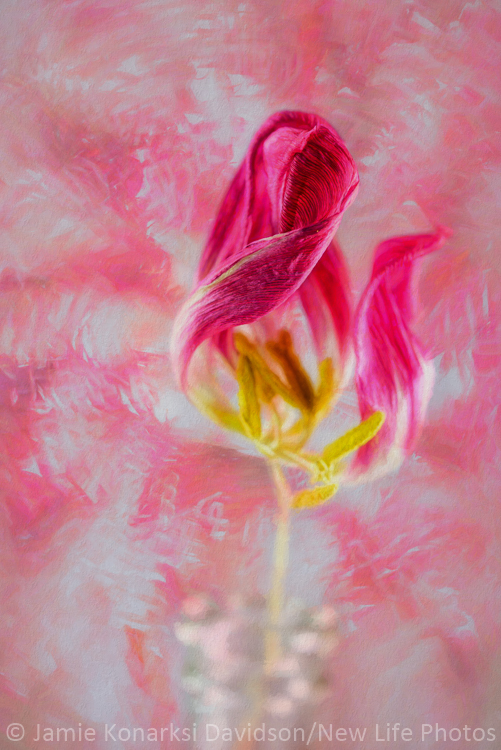 The dried tulip in the light tent, an abstract of petals in water on a light box and the mixing in of Topaz. Because I know there is more for me to learn (and know that I will), I can shamelessly share the results of these two sessions as well as how I chose to process the images. In a few, I incorporated textures and blending images. There are more experiments to come. I can’t wait to “bring it” with more knowledge and vision than the times before. I can’t wait to feel more “masterful” with the ten t and textures so I can unleash more of the artist within. What can YOU not wait for? Go do it!